Gul’s Couture houses an impressive collection of bridalwear and the moment we laid eyes on this maroon and red wedding lengha, we knew the fate for Khush’s autumn cover was sealed. The rich reds and antique gold tones create a perfect backdrop for dazzling craftwork and Moghul motif embroidery that makes up the body of this heavily embellished creation. Designed to celebrate the female form, the detail lengthens the body while the rich stones throughout serves as an accent colour for the pleated underskirt below. Using colour in this way ensures that the lengha is in line with tradition all the while drawing the eye seamlessly downwards, helping our model appear taller and streamlined. London-based bridal couturier Bismill Khan of Gul’s Couture has been dressing thousands of brides, grooms and their wedding guests for decades, making the brand one of the most well-known and sought-after names in Asian bridalwear. The company boasts an impressive range of exquisitely ornate bridalwear and party collections, perfect for those occasions where you really want to make a lasting impression. Invoking a sense of tradition, Gul’s Couture uses timeless embroideries to pay homage to the looks worn by brides for generations while suiting the contemporary woman. 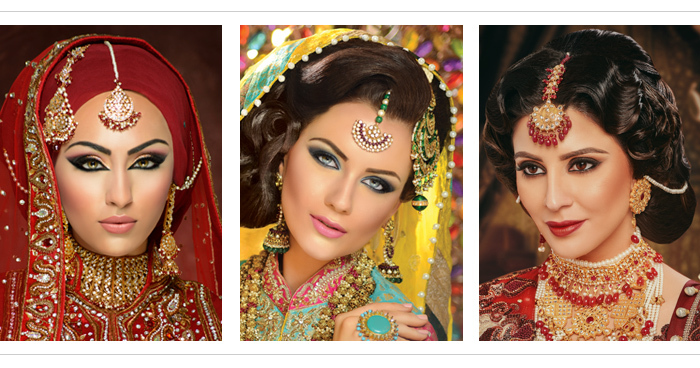 The signature style for any Pakistani bride is a smouldering eye teamed with gently tinted lips and a fresh complexion. Seasoned professional Summaya always begins a makeup look by focusing on the eyes, to ensure a clean finish when creating the base. Rich bronze tones are used to create depth and drama while copper undertones and deep browns along the lids add a hefty dose of drama without the severity of stark black. To ensure our model’s face wasn’t competing against the embellishments in the outfit and the heavy, ornate jewellery, we asked Summaya to keep the base fresh and luminous for Autumn. Next, Summaya prepped the model’s skin with a primer before smoothing on cream correctors and fluid foundation for a soft dewy finish. “Lots of people prefer using cream foundation sticks but I avoid them as they give a cakey finish and are prone to cracking,” Summaya reveals. Defined facial structure is a must for any bridal look, whether you want a traditional or contemporary look. So contouring and highlighting before a light infusion of earthy pink blush is par for the course. When eyes are the focus, it’s essential to ensure that the rest of the face is pared back so we kept the lips soft and matte, underlaying with a rose lip tone before blotting with tissue to maximise staying power. Avid readers of Khush Wedding will recognise the outstanding work of makeup artist Summaya Kidiya, who has been in our pages since the magazine’s launch. From the cover of our very first issue, the hugely talented makeup artist has collaborated with the Khush Creative team across all areas, from editorial and beauty to highly conceptualised bridal fashion shoots – displaying the multiple facets of her talent. With her work celebrated in the national as well as the international press, Summaya draws daily inspiration from art, fashion and pop culture. Briefed with creating regal Pakistani bridal hair, Shamalah drew inspiration from the Mughal era to form this vintage, waved updo. Pinned away from the face, the overall look is sleek and creates the perfect setting for hair ornaments and a bridal tika. Starting with a centre parting, Shamalah sectioned the hair into five before tonging each section. Next, the hair was brushed through to soften the curls before being pinned into a low bun. The look is strong enough to support a heavily embellished dupatta while staying true to the romantic vintage style we wanted for the Autumn issue. Finish with a fine dusting of hairspray and shine spray to maintain the sleek, elegant look. Shamalah says: “This is an ideal look for brides having a traditional wedding, with a nod to the majesty of the Mughal era. It’s a refreshing change to the tired high bun and is set to become a huge trend this AW15”. Following her first booking from an admiring bystander, Shamalah Asif’s reputation and social media following exploded and the young hair supremo has been on an upward trajectory ever since. 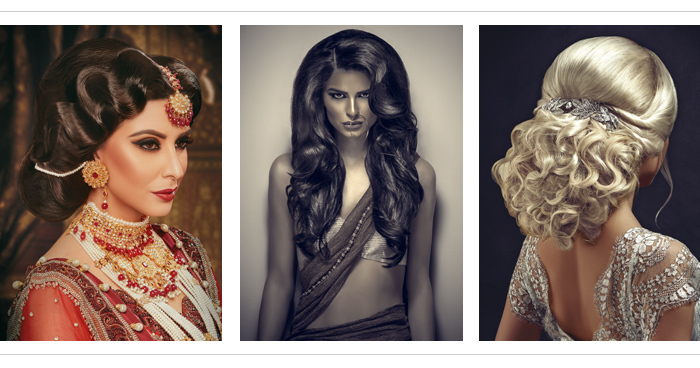 One of the best-known Asian bridal hair stylists in the UK, Shamalah has worked alongside the Khush Creative team on countless campaigns and innovative photoshoots. She can transform your look in a flash; from glossy red-carpet worthy waves to a sophisticated chignon, ideal for a reception dinner. Here is a professional who is truly at the top of her game. With a bridal lehenga as quintessentially Pakistani as Gul's Couture’s stunning piece, we wanted statement accessories that would further adorn our Autumn cover model. NK Collection provided a medley of majestic ornaments in exquisite pearl and ruby-coloured stones set in traditional designs made with mirror and antique metals. This stunning set includes a four-string necklace interspersed with pearls in the antique gold framework. Inspired by Maharani portraiture from the Mughal era, NK Collection bring together legacy and modernity in a striking confluence of styles. 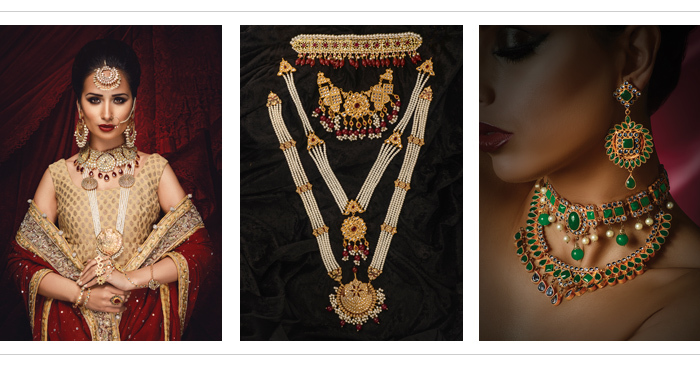 Launched just three years ago, NK?Collection is now one of the biggest names for Asian bridal jewellery in the country. 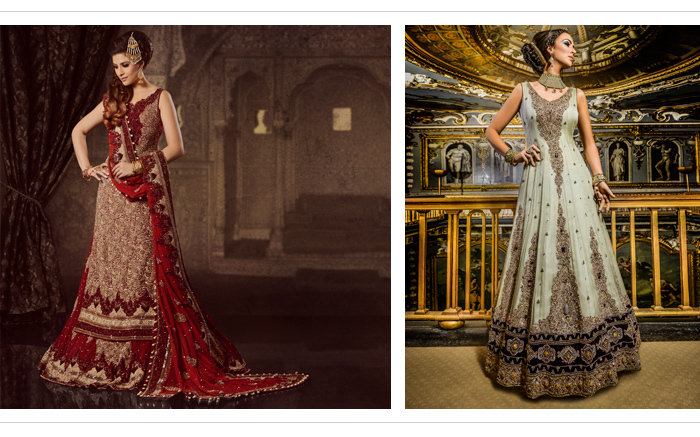 With a showroom in east London, concessions across the UK in Birmingham, Manchester and Bradford, and an online portal allowing customers across the world to buy pieces with the click of a mouse, NK Collection specialise in traditional Pakistani and Indian ornaments, providing stunnng jewels for brides regardless of cultures. The company also offers a bespoke service to allow couples to create heirloom pieces from scratch.